The Android operating system (as does iOS, I believe) has a rather annoying “feature”. That is, whenever your device starts charging, its screen turns on, presumably to let you know that the device is now charging. This sort of feedback is usually considered good interaction design. It’s important to inform the user when events occur. However, this must not come at the expense of annoying and inconveniencing the user. One problem with this “feature” becomes apparent when you plug your phone in to charge at night. After a couple of minutes, the device stops charging. A couple of minutes after that, the device starts to charge again, turning the screen on. A few minutes later, charging has stopped and started again, once again turning the screen on. Thus, every three minutes or so, the screen lights up. This is a problem if you’re like me and keep your phone in your bedroom. It can be difficult to get to sleep when your room is illuminated by your phone every few minutes. Not to mention it is a waste of energy. I looked online to find a solution to this issue. It turns out that Android does not have a built-in option for this, but as the saying goes, there’s an app for that. I found an entry on Stack Exchange that recommended an app called SnooZy Charger. This app has been pulled from the Google Play Store and the link to the APK on the app’s website is broken (I have submitted a pull request to fix this), but it is available to download from its GitHub repo. This way, the app will prevent the phone’s screen from turning on whenever the phone starts charging. This solves my problem and my bedroom no longer lights up every few minutes. There is one slight nuisance that comes with using this app, however. After SnooZy Charger has prevented the screen from turning on, the next time you want to unlock your phone, you must enter your passcode to do so, and not via fingerprint scanner or some other means. This is a limitation of the Android operating system that will hopefully be rectified in a future version of Android. One additional nifty feature of SnooZy Charger is the ability to view when your device started and stopped charging, as can be seen in the screenshot at the top of this post. 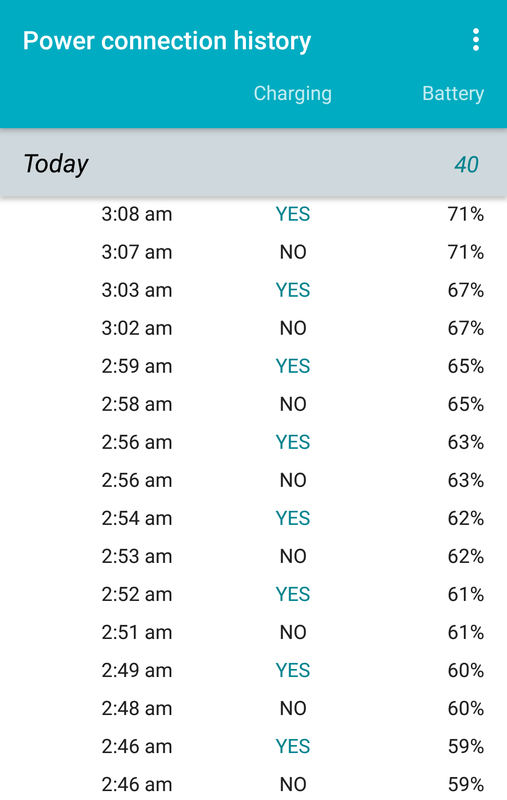 It is evident that the app has prevented my phone’s screen from lighting up many times through the night!